candied | Have YOU Ben Starr Struck? Did all that just REALLY happen? Watching it felt like a blur. 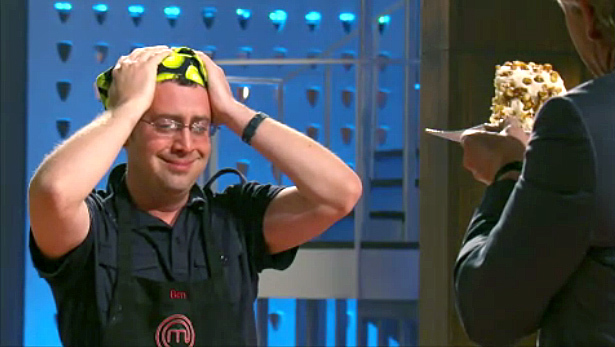 These were easily the two most intense and personally trying challenges I experienced on MasterChef. I’ll try to condense them into words, but I’m not sure it will work. Team leader. That’s nothing new to me. I’ve been president of this or that organization consistently since high school. But this time it’s different. This time I’m being observed by 3 of the most powerful culinary forces in this country. This time we’re cooking for Hollywood celebrities, who consistently eat at the world’s finest restaurants. And this time, my team has 90 minutes to cater a party for the Hollywood elite. 90 MINUTES? Please, Chef Ramsay, tell me exactly WHICH Hollywood catering chef is given 90 minutes’ notice to come up with a menu AND prepare 5 appetizer courses for a major Hollywood party. And when you find that chef who’s willing to do that, please just give ME the exorbitant sum you’d have to pay him or her, to get them to agree to cater that kind of a party at the last minute! I knew I was going to be a team leader for a good 12 hours, and I had in mind the team I would assemble. But when I find out that we’re going to have to prepare tiny, sophisticated bites for a discriminating crowd…I throw out my preconceived list and go with my gut, based on the challenge. Suzy first, because I’ve seen her produce dainty, tiny, perfect bites before. Tracy, because the level of sophistication she has presented thus far is WAY beyond my own ability. Esther, because she’s great with desserts and because she’s attended swanky Hollywood parties in her role as a talent attorney. Jenn, because she cooks right next to me in the MasterChef kitchen, and I’ve seen first-hand how precise and clever and inventive she is. And Christine, because she works flawlessly under pressure, and because I know she throws a mean party. I’d normally have NEVER waited to pick Christine last, but I was fairly confident Christian wouldn’t select her. So I take a risk and wait…and that risk paid off. Now we walk into a Michelin-starred kitchen. Not just Michelin-starred. But Gordon Ramsay’s own kitchen. Everything we produce in this kitchen will leave with HIS name on it. That’s some ridiculous pressure for an amateur home chef. Actually, a ridiculously unfair amount of pressure. No professional chef in his right mind would EVER allow himself to be put in a position where he has only 90 minutes to conceive a menu AND prepare enough food to cater a party for the Hollywood elite. And now, Gordon Ramsay has decided to place HIS name on the line, letting a bunch of amateur cooks turn out cuisine for such a party from his kitchen. I stand by my statement… GORDON RAMSAY HAS LOST HIS MIND. We actually created 5 courses, though only 3 were featured in the aired version of the show. Suzy made a delicious mint tomato gazpacho topped with edible flowers. Tracy handled the cheese course with a savory truffled goat cheese bite that was TO DIE FOR. Jenn followed up with a fruit course of watermelon lightly marinated in a zesty sriracha sauce, topped with creme fraiche. It was one of the most unique and delicious things I tasted in my entire MasterChef experience. Christine seems to perform spectacularly with meat, so I gave her the meat course and she turned out miniature Beef Wellingtons…a delicate round of puff pasty, gently seared tenderloin, sauteed mushrooms, and chive creme fraiche. 85 minutes later, 4 four of the 5 courses have been served. The only thing left is dessert. And Esther has turned out beautiful profiteroles (basically cream puffs), but Ramsay comes over and tastes her mocha filling, and says that it has “broken.” This means the cream has separated, kind of like curdled milk. Honestly, I don’t see what he’s complaining about. They taste great to me. But he’s a true Master Chef. And we’re feeding people with VERY sophisticated palates. And he is literally freaking out over the filling for the profiteroles and says it’s unacceptable. It’s time for Plan B. IS THERE A PLAN B??? I recall back to the cafeteria challenge, where simple berries triumphed over chocolate chip cookies. So all 6 of us begin slicing strawberries and kumquats, which are like a tiny orange the size of your thumb, sweet and tangy. To them we add some fresh sliced basil, some brown sugar, and a dollop of fresh cream. Ramsay is horrified. 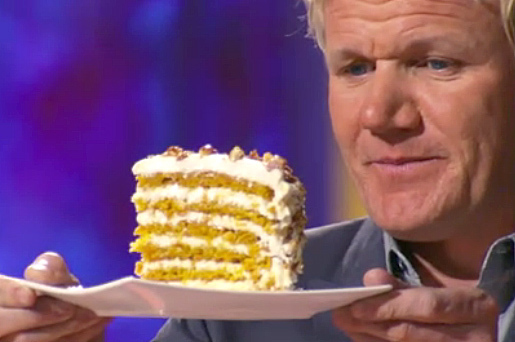 “This is the WORST dish EVER created in MasterChef!” he says. I’m not sure what he expected when he told us we our original dessert was unacceptable with only 5 minutes to go. Esther is devastated and feels responsible for the failure. As team leader, though, I shoulder the responsibility and take the backup dessert to serve to Hollywood’s elite. The reception is almost evenly split. It seems like half the people love the berries, and the other half love the Red Team’s elegant, sophisticated tartlet bites with raspberries and mint. We’ll have to wait to find the ultimate total. Turns out, 53% of the celebrities preferred Team Red’s tartless, and 47% love our 5-minute berries. I can live with that. However, it means that my team is going to the pressure test. And ultimately, that I failed as a team leader. The guilt is palpable. I feel awful. I shouldn’t have second guessed myself on the decision about the profiteroles. They looked magically beautiful. Ramsay had to rub the filling between his fingers to prove to me that it had broken, and I guarantee you that NONE of the celebrities up on the roof would be opening the cream puffs, digging out the filling with their fingers, and rubbing it around. Of COURSE not. They’d have popped them into their mouths, screamed “DELICIOUS!” and voted for my team. But in a moment of weakness, I buckled under the pressure of Ramsay’s rants, and I dragged my team to ultimate failure. And that’s from AFTER they were eliminated!!! 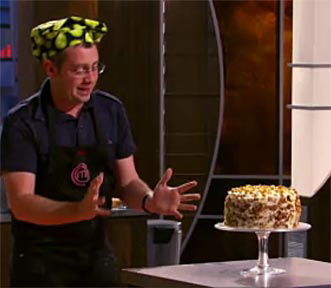 Esther is easily responsible for the funniest, brightest moments I experienced on MasterChef. Now, where were we? Ah, yes. Pressure Test. Due to my failure to stick up for my team against Ramsay, I’ve landed them all in a pressure test. I’m going to be honest…I spent the night sleepless, wondering what to do. Should I deliberately sabotage myself in the pressure test, so none of my girls gets sent home? I seriously considered this for hours. 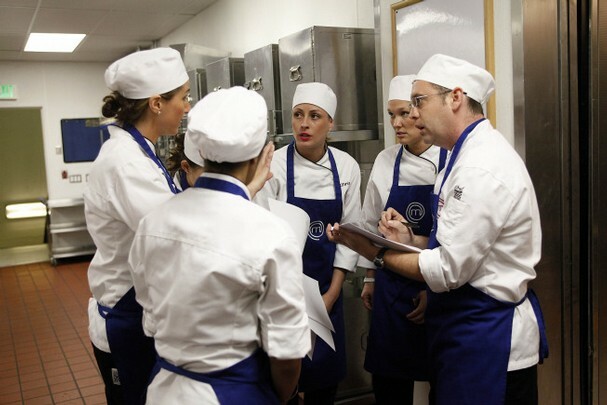 Then a little voice whispered…you have hundreds of dear friends and family, and millions of MasterChef fans who you would let down if you don’t perform to the best of your ability in every challenge. It would have been unfair to everyone for me to throw the challenge. The pressure test is a 6-layer cake. Pastry always strikes fear in the hearts of any chef. And I know that some of my team members are NOT comfortable baking. And I have dragged them into this challenge. Ramsay says, “BenStarr, if you were given the chance to save two of your team members, who would you save?” I immediately mention Tracy, because I know she’s uncomfortable baking. And I ask openly, “Any one else terrified of baking?” They all look at me with stoicism. My girls are SO brave and have SUCH integrity. No one wants to answer me. 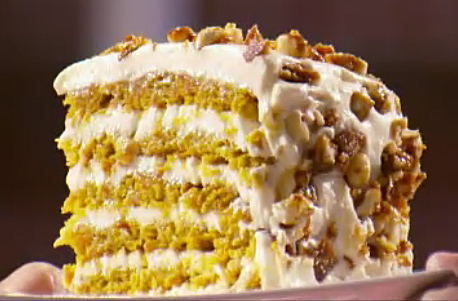 It just so happens that, for the past 5 years, I have been perfecting a pumpkin carrot layer cake. Carrot cake is normally made in a single, dense, moist layer with cream cheese frosting. But I have devised a way to make it light and spongy, kinda like a wedding cake, with cream cheese frosting, and candied nuts. So it’s literally an effortless 2 hours for me, churning out this cake I’ve made a dozen times. And at the end of the 2 hours, I look down at my cake…a cake I’ve made so many times…and I feel the weight of conflicting emotions crashing down onto my shoulders simultaneously. I feel joy that I’ve FINALLY produced something for the judges that is uniquely Ben Starr. I feel guilt, that I have competed against my team members in an “unfair” challenge, where I know exactly what I’m doing, and they’re in unfamiliar territory. And I feel sorrow, that someone is going to be eliminated, and if I had been a successful team leader, we would ALL be safe from elimination and would be watching the other team bake 6 layer cakes. And that passes into one ear and out the other, because I can’t even process a compliment like that. Graham Elliot compares the cake to some carnal climax that I’ll avoid repeating, and Joe Bastianich says that he has hated every carrot cake he’s ever eaten because it was heavy and greasy, and somehow I’ve managed to transform it into an ethereal, delectable masterpiece. In tears, I return to my station. 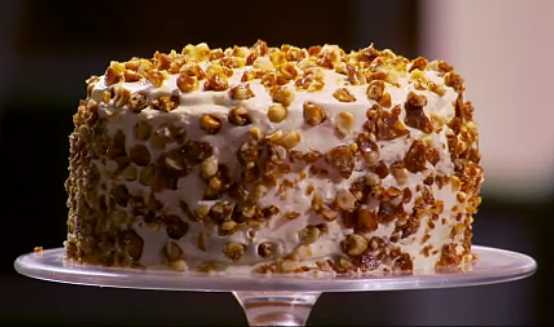 The judges determine that Esther’s cake has been her downfall, and decide to send her home. Wretched…I adore Esther, she is an incredibly talented baker and has started her own cookie company which has rocketed to success in a few short weeks. And to see her leave MasterChef breaks my heart. I feel like it’s my fault. This has been the most intense day of my life, to date. The combination of victory, guilt, and sorrow is indescribable. For the first time since my signature dish, I feel like the judges respect my abilities as a chef. Yet there is the looming specter of my failure as a team leader. This has been an emotional roller coaster. The judges send Esther home. Unfairly, in my opinion. Esther has done some amazing things on MasterChef, and I really think she’s the strongest baker on the show. She now has started a cookie company called Batch from Scratch, which has rocketed to success in a few short weeks. For some of the most unique cookies you’ll ever taste, go to her site! I will miss Esther, my little Peanut, terribly. And I’ll have to think long and hard before I try to win another invention test to become a team captain!